Day 4 of Event No. 46, the $10,000 No-Limit Hold'em Six-Handed Championship saw the final two players of a 474-player field return to battle heads up for the biggest first-place prize thus far at the 2011 World Series of Poker . . . $1,158,481. After four days of play, Joe Ebanks captured his first gold bracelet while simultaneously becoming the WSOP’s latest millionaire. Yesterday, a laundry-list of notables were among the 22 runners on Day 3 including Chris Moorman, Mike Sowers, David Benefield, Lee Markholt, Bertrand “ElkY” Grospellier, and Ben Lamb. The latter two garnered a lot of attention as both were going for their second bracelet of the 2011 WSOP. Lamb was fresh off a victory in Event #42 $10,000 Pot-Limit Omaha Championship where he captured his first WSOP gold bracelet and the accompanying $814,436 first-place prize. He was also the player atop the WSOP Player-of-the-Year Race. Likewise, Grospellier was looking for another bracelet to accompany the one he won in Event #21 Seven Card Stud Championship, which also came with a $331,639 prize; in addition, Grospellier, who sat in 18th place on the POY Leaderboard, was looking to put himself in contention for that coveted title. Unfortunately, one of those storylines came to an end early when Lamb was eliminated from the tournament in 12th place. In fact, he was just one of 16 players who failed to make the final table. While Lamb’s run came to an end, Grospellier’s continued all the way to the final table, which he began in fourth chip position. The first elimination of the final table came when Mike Sowers raised to 105,000 on the button only to have Ebanks three-bet to 275,000 from the big blind. Sowers called as the flop came down . Ebanks led out for 275,000, Sowers called, and the appeared on the turn. Ebanks moved all in, and much to the crowd's surprise, Sowers made the call. Sowers was ahead with top pair, but Ebanks held a double-gutted straight draw on top of a flush draw. When the spiked on the river and gave Ebanks the said flush, Sowers graciously stood from the table, shook hands with the entire final table, and exited in sixth place ($138,301). The next player to go was none other than Taylor Paur after his failed to hold against Ebanks’ as the board ran out . Paur received $198,140 for his fifth-place finish. Tristan Wade followed Paur out the door when he got his chips all in with against the of Chris Moorman. The board ran out and Wade was eliminated in fourth place ($292,866). Three-handed battle lasted a long time before Grospellier’s dreams of winning his second bracelet came to an end. Grospellier had grown short stacked and moved all in with only to run into the of Ebanks. The board ran out an uneventful and Grospellier was eliminated in third place ($447,074). 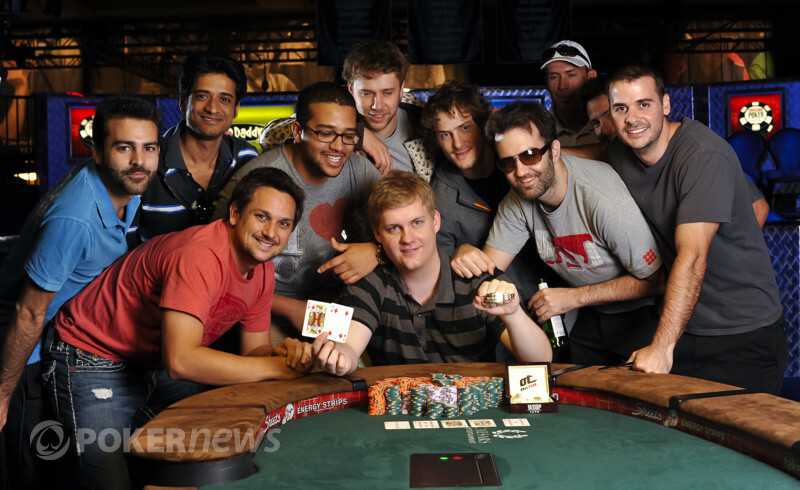 The Frenchman’s performance will no doubt go a long way in the 2011 WSOP POY race. Heads-up play began with fairly even stacks. Moorman held a slight edge with 7.4 million to the 6.8 million of Ebanks, but it didn’t take long for Ebanks to capture the chip lead and build some momentum; unfortunately for him, Day 3 came to an end when the hard-stop time was reach. That brought the two players back for a fourth day with Moorman holding 3.215 million to Ebanks 11.015 of Ebanks. When the two players returned on Thursday, play lasted just a few hands before Moorman succumbed to Ebanks’ big chip advantage. While Moorman finished as runner up for $716,282, he managed to notch his fifth cash of the 2011 WSOP and put himself in contention for the coveted POY title. Congratulations to Joe Ebanks on capturing his first bracelet and the $1,158,481 first-place prize. That does it for our coverage from Event #46 $10,000 No-Limit Hold’em/Six Handed Championship, but there is still plenty of tournament action to come. 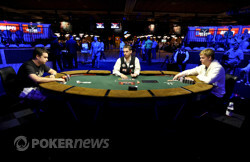 Stay tuned to PokerNews as our Live Reporting Team will be bringing you all the action and eliminations from the 2011 WSOP. Joe Ebanks captures the gold bracelet in event 46, along with a first place prize over a million dollars. Chirs Moorman had the button and raised to 240,000. Joe Ebanks called, and the flop came down . Both players checked. The turn was the , and Ebanks led for 250,000. Moorman went into the tank, then moved all in. Ebanks asked for a count (it was 2.06 million total), and when he received the amount, he sat back in his chair and put his hands on his head. He eventually announced, "call," and the hands were opened. Ebanks was well ahead with a pair of kings and a diamond flush draw, and only a non-diamond nine or ace would save Moorman. The river was a nine, but the completed Ebanks flush, making him our champion! Congratulations to Chris Moorman on his second-place finish. 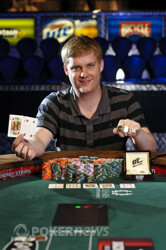 This was his second final table at the 2011 World Series of Poker, and he receives $716,282 for his great play. Joe Ebanks limped on the button and Chris Moorman checked his option in the big blind. When the flop came down , Moorman check-called a bet of 150,000, leading to the on the turn. Again Moorman check-called a bet, this time 350,000, and the appeared on the river. 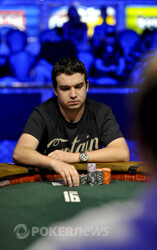 Moorman checked, Ebanks fired out 650,000, and this time the Brit laid down his hand. The cards are in the air, and it's time to crown a champion! It's Day 4 of Event #46: $10,000 No-Limit Hold’em / Six Handed Championship, and we're down to two players; Chris Moorman and Joe Ebanks. Each player is guaranteed over $700,000, and the winner will receive $1,158,481 and the WSOP gold bracelet. Ten levels of poker were not enough to finish Event #46: $10,000 No-Limit Hold’em / Six Handed Championship here on Day 3, so we will return tomorrow at 3 p.m. PDT for one final day. The action will start soon, so keep it locked right here! Event 46 bracelet winner Joe Ebanks and friends.